TUFTY: What if you knew where your Teddy Bear really came from? TUFTY will air on Irish national TV this Monday 4th April, RTÉ 2, 23:25. Set your telly box and don’t miss it! TUFTY will be screening in the Underground Cinema February programme. Thursday, 24th February 2011 at 7.30pm, Kingston Hotel, Dun Laoghaire. Also TUFTY will be taking the ferry over to London on Paddy’s Day for the special Underground Cinema event in London’s Shortwave Cinema. Underground Cinema are delighted to announce that we will be screening a selection of brilliant short Irish Films along with a Special Feature screening of Shtax – A Homecoming on St Patricks Day in London. We will be joined some of Irelands most up and coming directors and actors for what looks to be a brilliant night of Irish Cinema. The films will be screened in Londons Shortwave Cinema, regarded as one of the best independent cinema’s in the capital. Entertainment will also be provided on the night by traditional Irish Band Ciúnas. Il y a des tas de façons de vivre différemment, ce n’est après tout qu’une question de point de vue. Il suffit juste de se démarquer de ses habitudes de regard, de considérer les choses sous un autre angle que celui que l’on utilise ordinairement et la vie, alors, prend une tout autre coloration. La méthode appliquée par exemple par les deux frères irlandais Jason et Brendan Butler aux ours en peluche est particulièrement symptomatique. De prime abord, Tufty est un mignon petit ourson, l’objet transitionnel idéal pour un enfant en bas âge, mais replacez-le dans son contexte naturel et vous découvrirez que, sous son étoffe de velours, bat un cœur sensible qui ne demande qu’à s’épanouir dans des conditions plus harmonieuses. There are lots of ways to live differently, it is after all a matter of perspective. We just have to stand out from its habit of looking, to look at things from a different perspective than what is used commonly and life, then takes a different coloration. The method used for example by two Irish brothers Jason and Brendan Butler in the teddy bear is particularly symptomatic. At first glance, Tufty is a cute little bear, the transitional object is ideal for a young child, but put it back in its natural context and you’ll discover that under his velvet fabric, beats a sensitive heart that only requires to flourish under more harmonious conditions. We’re screening it and talking about it at ShortSpace in Filmbase this Thursday evening. TUFTY is joint-winner of the Audience Award for Best Short at the Dead by Dawn Horror Festival. 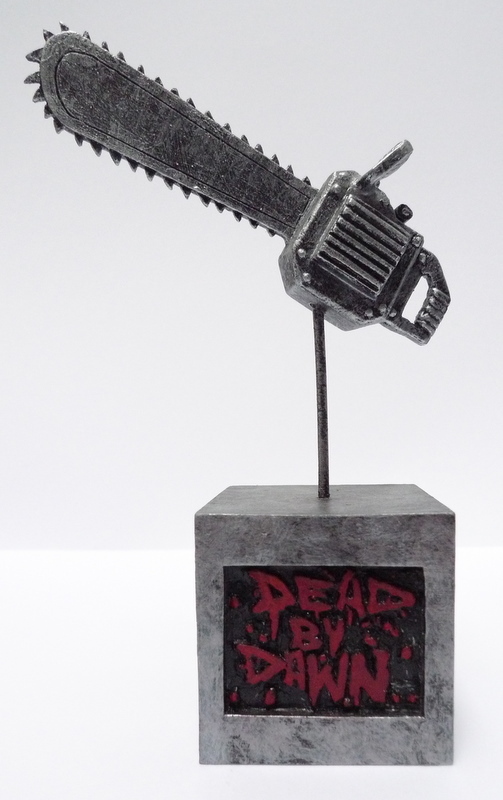 The award itself is a little chainsaw statuette which sounds brilliant. I’ll post up pics of it when it arrives. Thanks to the Scottish audience for their support. I didn’t even know we’d made a horror film! TUFTY will be screening in the Brigadoon section of the SITGES International Fantastic Film Festival of Catalonia on Monday the 11th of October. The filmmakers will be in attendance!